A novel vanadate-compound Ca10Li(VO4)7 was synthesized by using solid-state reaction. 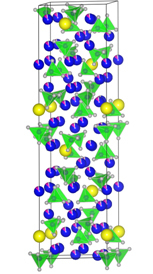 Phase purity and crystal structure of Ca10Li(VO4)7 were determined by X-ray powder diffractions and the Rietveld refinement analysis (R3c, Z = 6, a = 10.8223(1) nm, c = 38.0451(7) nm). By doping with Eu3+, Ca10-1.5xEuxLi(VO4)7 phosphors showed the most intense emission at 613 nm under 465 nm excitation, and their emission intensities were greatly affected by firing temperature and Eu3+ concentration. Furthermore, at 150 °C, the emission intensity maintained about 77% of that measured at room temperature. These experimental results indicate that this kind of red-emitting Ca10-1.5xEuxLi(VO4)7 phosphors may be potentially applied in white light-emitting diodes (LEDs).